What did you take from your debut Mukunda? Mukunda is a film that ran of characterizations. The male lead role didn’t have much scope to emote. It was a one-faceted character. It was a memorable debut for me. I got personally influenced by the character and i carried forward a few traits in real life too. Tell us about your character in Kanche? I play the character of Dhoopati Hari Babu who belongs to a lower caste (sannayi vayidyam and gollu teeyadam). Seeta Devi played by Pragya Jaiswal belongs to royal family. It’s basically a love story and has the backdrop of a war. There are two time lines in the movie. In one timeline, I play the role of an youngster in village who is in early 20’s. In another timeline, I play the role of a soldier who is aged 30. It was easy to do soldier role as it needs more of physical effort. But doing a village character in 1930’s is very difficult as it requires very good native Telugu. Title Kanche is metaphorically used to denote the divide of society by castes and by other means. In order to train myself for soldier character, I was coached by a retired military officer and learned body language from him. Krish gave a few DVDs of Chalam and asked me to take him as reference while speaking native Telugu. Krish is very particular about language and modulation. He and dialogue writer Burra Sai Madhav helped me to do well in village character. How exhaustive was it while shooting for war episodes? We had a 25-days schedule in Georgia. It was stressful as we had to continuously shoot. Since it was a war episode, most of the scenes were shot using wide angles where all the artists are covered. Most of the time, there was no sync among the actors and we had to take several retakes. Is it an advantage or a disadvantage to be from mega family? It’s both I guess. It’s advantageous because of the fame and popularity. It’s a disadvantage because fans expect us to perform well at box office all the time. How do you handle the peer pressure among your cousins? I only think of myself and concentrate on my work. I want to do content based films. Content forms foundation for any hit despite having stars. Tell us about your next movie? Shooting of my next film is almost complete. Producer is planning to release it in December. We have two titles lined up for it - Loafer and Maa Amma Mahalakshmi. Both titles are apt for the content. Puri Jagan will take a call regarding the title when he launches the first look in next month. Tell us about Niharika entry as a film actress and the pressure from fans? Fans might have expressed concern through social media, but nobody has told anything against it directly. She is doing a content driven film. It’s not a film where heroine does skinshow. Manjula who comes from a family of a superstar is an example and she did content driven films. We all make sure that Nikarika will go on right path in films. 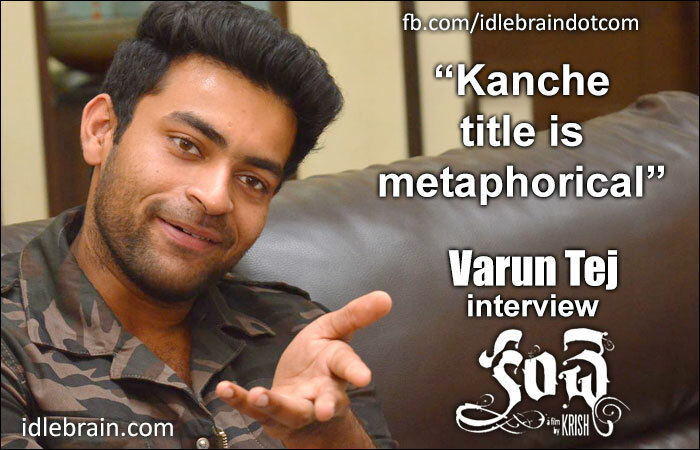 What’s your gut feel on Kanche? I haven’t seen the final product. I am waiting to watch it in Dolby ATMOS in a public theater on the release day. It’s a content driven film and expecting word of mouth to do the publicity. Entire post-production (except for dubbing) was done in Mumbai. I am eagerly waiting for the result. Right now, I am in the process of assessing myself. I will come to know what kind of films I need to choose after the release of Loafer (or Maa Amma Mahalakshmi). I haven’t finalized the script of my fourth film yet.